I decided I needed to make more than I did last year so I doubled the recipe, which as it turned out made almost 10 jars!!! And those 10 jars are now sat in the cupboard to ‘age’ for a minimum of 4 weeks before I can use any of them. I will write out the full recipe and instructions, but, I will say it takes a good couple of days to make this mincemeat properly, but that being said, the house does smell lovely!! For the mincemeat (I doubled these amounts) it should make about 4 jars. Wash all of the dried fruit under running water and leave to dry. Peel, core and small dice the apples. In a large oven proof mixing bowl combine all of the ingredients EXCEPT the brandy, stir them all together so no one ingredient is stuck together. Cover the bowl with a clean cloth and leave the mixture overnight in a cool place. THE NEXT DAY, pre-heat the oven to 120C. Cover the bowl loosely with foil and bake in the oven for 3 hours. Then remove from the oven. The suet will have melted and the apples will have stewed, leaving the mincemeat covered in a thin watery fat, but this is how it should be. As it cools, stir the mixture from time to time to coat everything in the melted suet. Once it is cold, stir again adding the brandy, then COVER again and LEAVE OVER NIGHT. 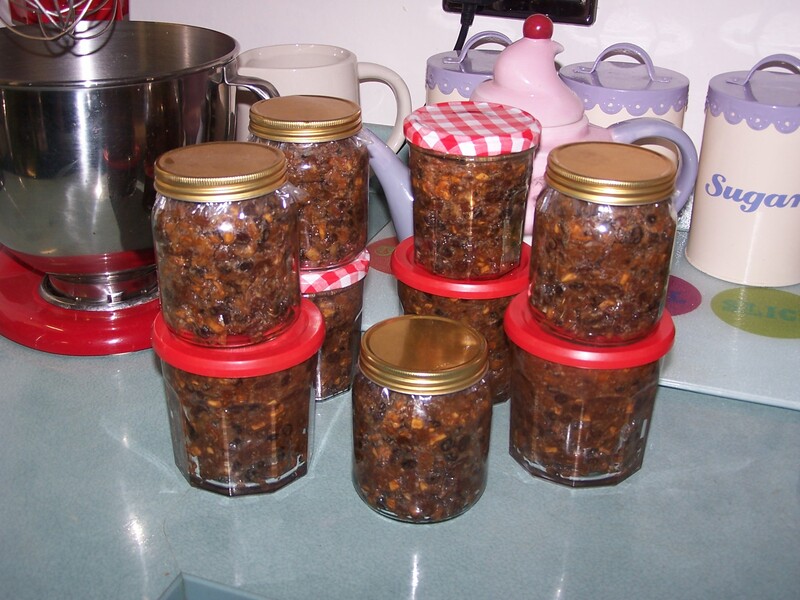 THE NEXT DAY, stir the mincemeat for a final time, and then fill your jars. 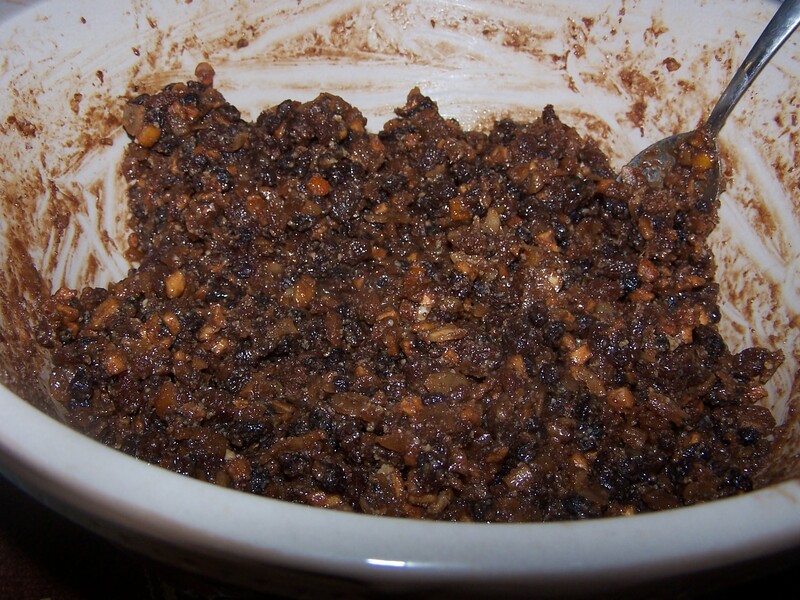 Age the mincemeat for at least 4 weeks before you use any, but, the longer you leave it the better it will become. Here is a picture of mine, one picture is of the mincemeat in the massive bowl I made it in and the second picture is of all of my jars stacked up ready to into my cupboard. I will be making so much with all of these jars (probably for the next year), it’s a good job my husband loves mincemeat!!! 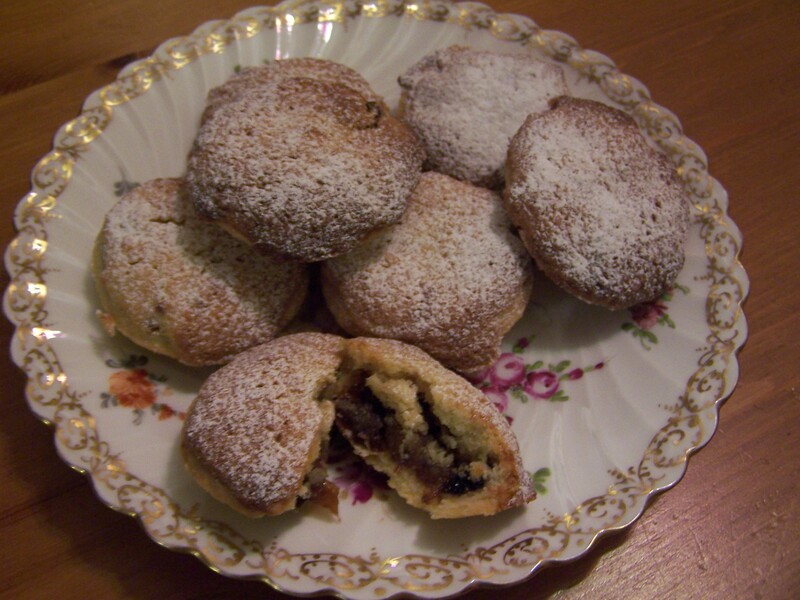 Brandy Frangipane Mince Pies With Home Made Mincemeat. The recipe uses a slightly sweet shortcrust pastry, and mine could have been sweeter but I only had golden caster sugar in the cupboard as I ran out of white caster whilst making some mini lemon drizzle muffins on Monday evening, yes, another evening baking session, why I get the urge to bake at night I really don’t know, anyway, back to the mince pies, so you have a sweet shortcrust, which the recipe said I could make 36 pies from but I was afraid the pastry would stick to my table so I only made 24, with thicker pastry. You put your pies cases in the patty tins in the fridge while you make the frangipane. I also added a good glug of brandy to my mincemeat, just for an extra boozy flavour. Once you’re frangipane is made and your mincemeat is brandied enough you begin to assemble. A small teaspoon of mincemeat goes in first, which I kind of smoothed down, then a teaspoon of frangipane goes on top that I smoothed down too and tried to make sure the edges were sealed so my mincemeat didn’t escape. Then, you are supposed to put almond flakes on top, but I completely forgot, and you bake them for 20-25 mins at 180C, until they are golden brown and looking delicious. When you take them out of the oven put them on a rack to cool and dust with icing sugar. 2 – 3 tbsp water. You will also need a jar of mincemeat. For the pastry I mixed the flour and sugar and then rubbed in the butter, once rubbed in, I added the egg yolk and some water. I then put it in the freezer for about 10 mins before I rolled it out. Try to roll out the pastry dough in to 36 circles and use them in 3, 12 hole patty tins, then put the tins in the fridge while you make the frangipane. For the frangipane, In a mixer beat the butter until soft, then add the sugar and beat again until pale and fluffy, and then beat in the eggs. Mix in the flour, ground almonds and brandy. Then take your pastry cases in tins from the fridge and used a small teaspoon of mincemeat, topped off with a teaspoon of frangipane, smooth it down and sprinkle on some flaked almonds. Bake in you oven at 180C for 20-25 minutes. Once golden and looking good, remove from the oven and dust with icing sugar. Here is a picture of some of the ones I made. Please, enjoy making, and, eating these. Thank you!